Matthew Vaughn's "Kingsman: The Secret Service" opened across the UK last month and in the USA on 13th February. The film stars Colin Firth as the inimitably suave spy Harry Hart (codename: Galahad) who brings a new protege into the fold of an independent and top-secret spy agency known as the Kingsman. The other star of the film is, of course, Savile Row and its tailoring. The Kingsmen of the title operate from behind the doors of a Savile Row tailors and, naturally, the gentlemen spies of the organisation are all dressed beautifully in bespoke Savile Row tailoring, and are equipped with the finest accessories British artisans can provide (albeit with some special modifications to suit their particular line of work). Costume designer Arianne Phillips has done an exceptional job on the film and in this area in particular. The suiting is fantastic and manages to be both traditional and directional at the same time. Gone is the basic navy two-button suit. In "Kingsman", everything is double-breasted and patterned. No doubt we'll all be clamouring to kit ourselves out in Kingsman style, which is just as well as this is where "Kingsman" manages to pull off a film merchandising first. It seems incredible that this has never been done before, however, the production has teamed with online luxury menswear retailer Mr. Porter to create the Kingsman Collection. The Kingsman Collection comprises many of the pieces actually worn by the lead characters in the film, including the suiting, and accessories are from a literal who's who of British classic manufacturers, including Bremont, Cutler & Gross, Drakes, and George Cleverley. And, like Bond, the Kingsman get their shirts from Turnbull & Asser. 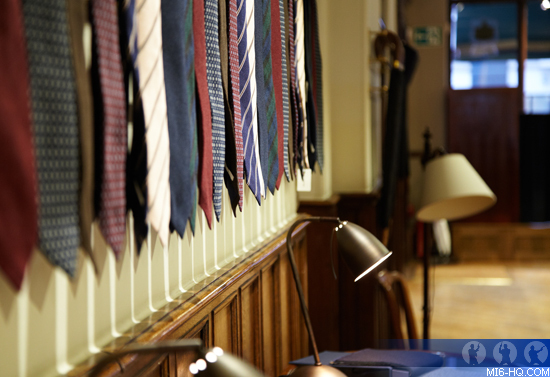 So, depending on your budget, you too could be cutting a dash in Kingsman apparel. All this might just seem like clever marketing - and it is - but with product placement being such a key factor in filmmaking these days, it makes sense to take ownership of if. Creating an actual brand that exists in the real world as well as in the film is all part of Kingsman"s meta approach. For instance, the Kingsman tailoring shop is loosely based on Huntsman and occupies the same location on the Row. The exterior was used for filming, whilst the interior was a set (which, incidentally, looks a lot like Huntsman). However, for a few days, Huntsman actually became Kingsman, with the shop being transformed to match the film's interior and selling only the clothes from the collection. This blurring of boundaries between reality and fiction is just one of the things that makes "Kingsman" so enjoyable. Arianne Phillips On Clothing The Kingsman: I got a phone call at six in the morning. I was dead asleep. It was Matthew Vaughn, the director of the film, who I already knew a little bit as he had produced a film I had worked on years before, but I hadn't talked to him in years. He woke me up saying, "I've got this movie I really want you to design. It's about British gentlemen elite spies, stars Colin Firth. And their base of operations is a Savile Row tailors." As soon as he said that, I was totally awake. I'm more interested in narrative, so I'm not really that interested in being a fashion designer. I'm interested in the fantasy, telling stories. People do ask me all the time when I've designed costumes in movies, "where can I get these clothes?" but when you're designing a film, it's usually a one-off, so for the first time the costumes can live on. [Vaughn] went on to say that he was in talks with Natalie Massenet and Net-a-Porter and Mr. Porter, to do a costume to collection "shoppable" brand that will be blending fact and fiction. I was completely enthralled. He had me. I think mainly because, speaking as a costume designer, we've never really been invited to be a part of this element, which seems ridiculous in terms of integrity of product from film to shop. As you know, the relationship between film and fashion goes both ways. Fashion influences film and film inspires fashion but, until now, it hasn't really been right. Introducing The Kingsman Collection From Mr. Porter: At the heart of the Kingsman wardrobe is a broad selection of classic British tailoring items designed to cater for the needs of the modern gentleman spy. All suiting is double- breasted and sports jackets are single-breasted. Also included are overcoats, a tuxedo and even a velvet smoking jacket, all featuring traditionally patterned cloths woven exclusively for Kingsman by the best British mills and made in England. Kingsman, an entire bespoke 60-piece collection designed in collaboration with Vaughn, award-winning Costume Designer Arianne Phillips, and Mr Porter's Buying Director Toby Bateman includes suiting, outerwear, shirting, knitwear and accessories made from the best of British cloth and from the best of British craftsmanship. MR PORTER.COM has also launched a competition on site to win $7,500 to spend on the Kingsman collection. 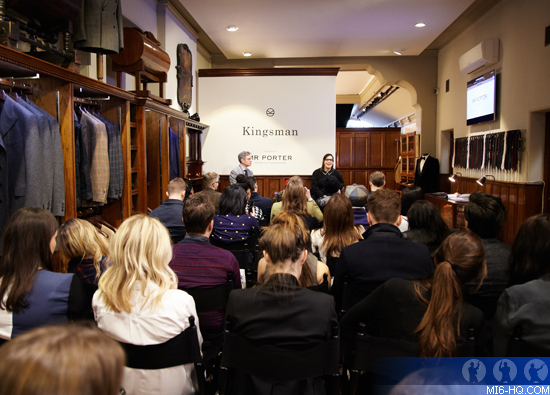 Customers can register interest and sign up for Kingsman collection updates at: mrporter.com/kingsman.